The Vassar College women’s swimming & diving team took a 163-94 victory over New Paltz at Elting Pool on Friday night. It marked the first time since the 2015-16 season that the Brewers beat the Hawks in a dual meet. 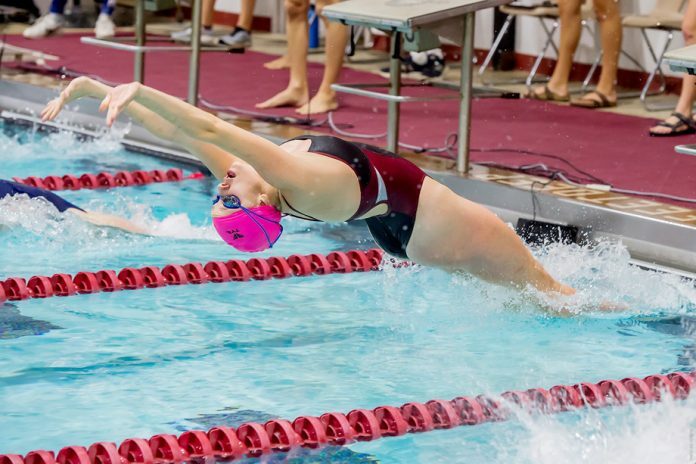 NEW PALTZ – Jesse Ecklund posted three wins—including the longest and shortest events on the program—to lead the Vassar College women’s swimming & diving team to a 163-94 victory over New Paltz at Elting Pool on Friday night. It marked the first time since the 2015-16 season that the Brewers beat the Hawks in a dual meet. Ecklund’s first event was the 1650 yard freestyle, and she won by 26 seconds over teammate Angharad Healey. Ecklund’s time was 18:35.82, while Healey finished in 19:01.84. Her next victory required little more than 26 seconds, as Ecklund also took first in the 50 freestyle with a 26.16-second clocking. Then, in the 200 backstroke, she set a facility record of 2:08.67 for her third individual triumph of the night. Ecklund made it 4-for-4 in the 400 freestyle relay, where she joined with Brynn Lautenbacher, Stephanie Kaplan and Kendall Hayes to notch a winning time of 3:46.27. Hayes picked up a pair of individual wins, leading Vassar sweeps in both the 200 freestyle and 500 freestyle. In the 200 freestyle, she finished in 2:02.60, while Ellie Kennedy-Wood was second in 2:08.94. Hayes (5:27.67) took first ahead of Kael Ragnini (5:32.97) in the 500 freestyle. She was also second behind Lautenbacher in the 200 butterfly (2:24.04). Lautenbacher’s winning time in the 200 butterfly was 2:14.75. She also broke the 1:00 barrier in the 100 butterfly, touching the wall in 59.81 seconds. Kennedy-Wood placed second in 1:02.99. It was another 1-2 for the Brewers in the 100 breaststroke, with Shannon Schrope (1:09.44) edging Hayley Schultz (1:09.77) for the victory. Schrope also won the 200 breaststroke (2:33.30), while Schultz’s 100-freestyle time of 58.55 seconds was good for second place. In addition, Rhea Randhawa took first in the 200 individual medley (2:15.51) to go along with second-place efforts in the 100 backstroke (1:01.47) and 200 backstroke (2:12.64). This was Vassar’s final dual meet until January. The Brewers will take part in the two-day RIT Invitational on Nov. 30-Dec. 1.